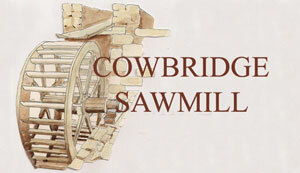 Cowbridge Sawmill is situated in the village of Timberscombe, set in the midst of the beautiful Exmoor countryside. The first Mill on this site dates from at least the 14th Century when it produced flour for the local people. The amenity survived until the late 19th Century. In 1904 the Mill was converted to a Sawmill which continued to serve the local community. By the end of the 20th century the Mill was in urgent need of renovation. This renovation has been driven by the vision and determination of Mr Owen Rush, who together with his wife Angela purchased the Mill in a derelict state in 1995. The old mill has been reroofed and the floors rebuilt, while the dilapidated workshop and forge have been demolished and replaced by an attractive two storey building of local stone with a slate roof. As well as enhancing the appearance of the Mill, the new building contains a forge, workshop and an area to display items providing an interesting attraction for the village of Timberscombe and the Exmoor region. The most ambitious aspect of the project has been hidden from the view of passers by. This is the restoration of the 14 ft water wheel which used water from the Mill Leat to power the Mill for over 700 years. The wheel is now turning again and drives a number of vintage woodworking machines. The owner’s vision is for a working water mill and forge which will provide energy and preserve a vital part of our heritage. Whilst working on the Mill, Mr Rush has also acquired a substantial collection of agricultural and industrial machines and tools. These are displayed as a private collection, which is open to the public, free of charge, by appointment or on regularly advertised open days. The site is an excellent amenity for everyone who cares for our environment and wishes to see our national heritage preserved. To find out more about the village of Timberscombe click HERE to go to the village website.